My candy coma from Halloween was motivation to get me to the 3rd annual Lakefront Classic 10K and 1 miler on Saturday morning. This 10K put on by the New Orleans Track Club was the perfect distance for me to tackle after a really difficult and event filled week. 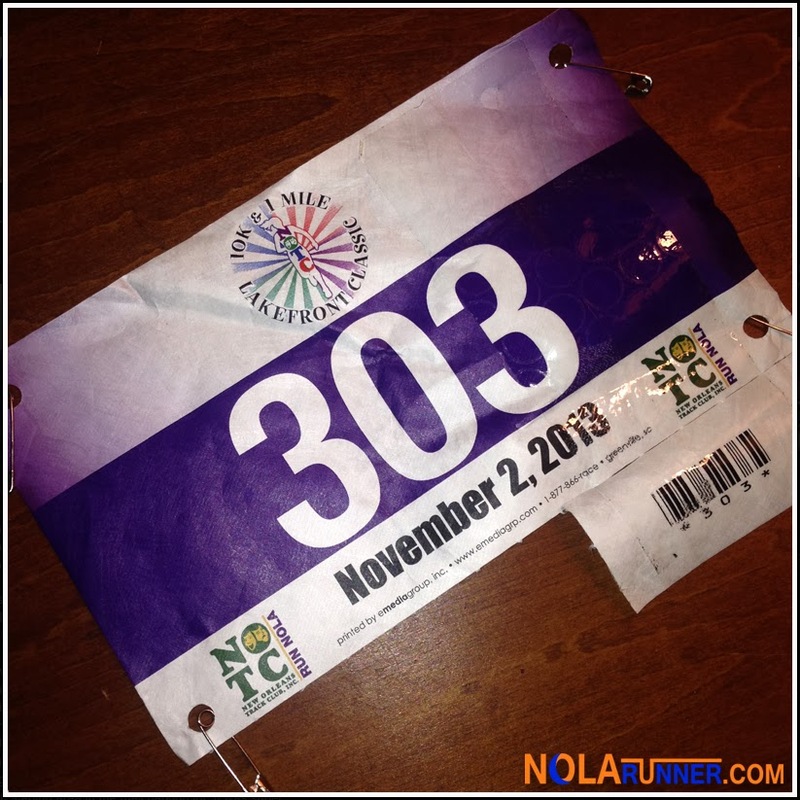 I registered race morning on-site, and had a quick and painless process to get my number. Anne had pre-registered for the race, but suffered a severe allergic reaction early last week. Laughing in the face of good judgment, she met me at registration. She was itching to get back in to her workout routine, and decided that she would attempt some easy mileage on the course. Her idea of easy mileage is 4-miles. Have I mentioned the relationship she has with good judgment? While I was pinning on my race bib, the one mile race took off with a gaggle of kids testing their speed. Once the final mile participant crossed the finish line, the 10K'ers gathered in the middle of Lakeshore Drive for a rendition of the National Anthem and an informal "Ready, Set, Go!" start. 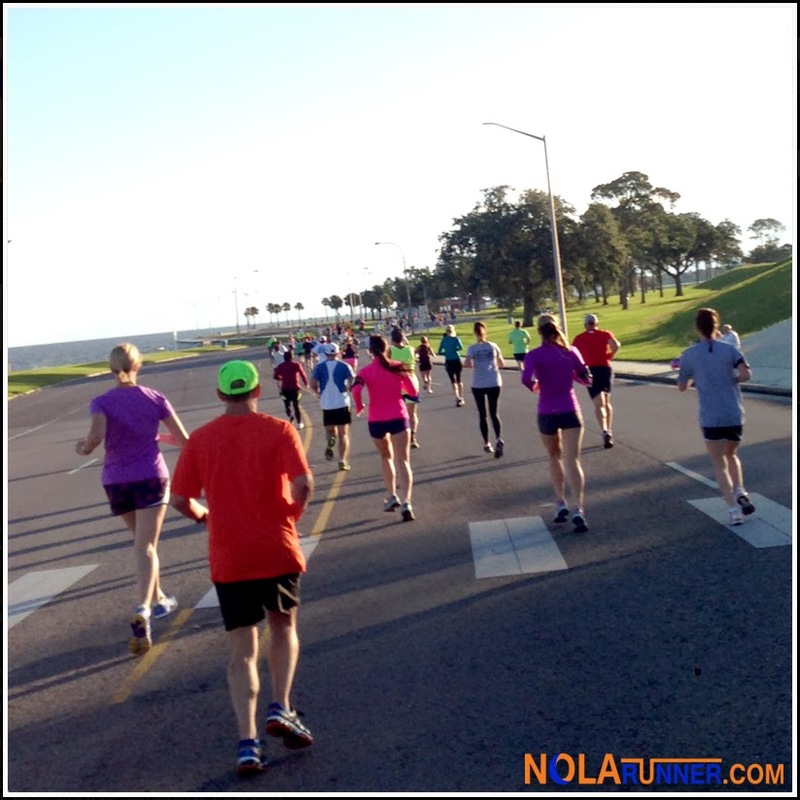 The course is an out and back along the shores of Lake Pontchartain. The curves of Lakeshore Drive invoke necessary strategy for this race, as running the tangents are much more important when the turns are wide and frequent. The first 5K of the race was mostly in to the sun with wind to the rear. The second 5K turns your back on the glare, but caused some difficulty with the shear off the lake. Throw in a couple overpasses that cross tributaries to the lake, and it makes for a challenging but beautiful course. This is what I call a "no-frills race." The registration and setup process are simple, the start and finish lines are one in the same, and the amenities consist of a cotton t-shirt and post race beer. While there are those who run for technical fabric shirts and a medal, sometimes these no-frills race are just what I need to boost my training regimen. Running under race conditions, with other runners, and having on-course support is often times worth the registration fee. Throw in the impeccable weather that we had for the race along with the beautiful scenery, and you have a great race investment. An added bonus to race day was knowing that Anne and I would make a post-race excursion to the Starbucks on Harrison Avenue. 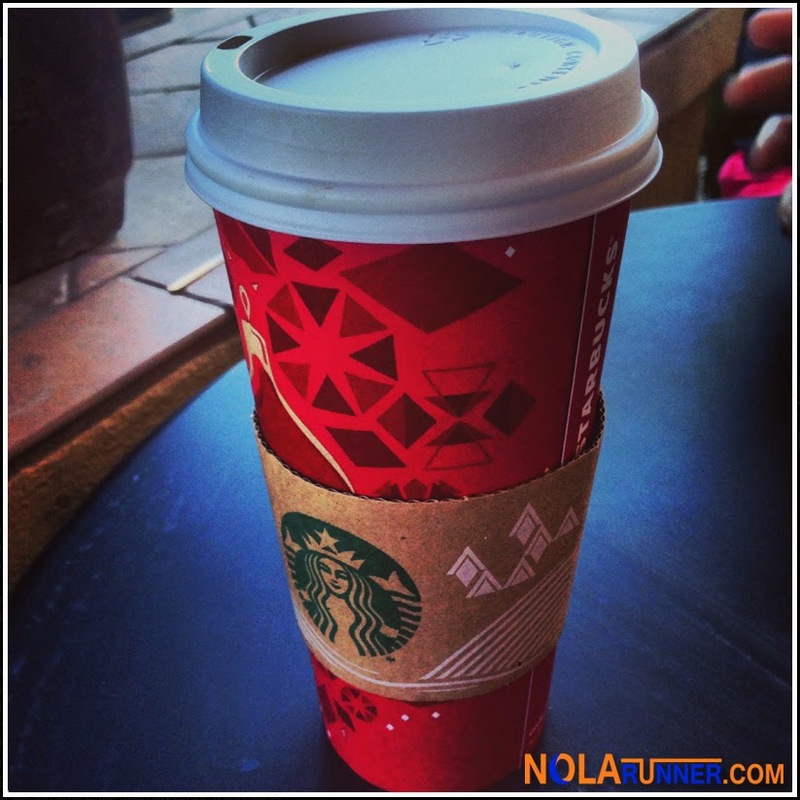 The red cups are back, as are the Skinny Peppermint Mocha lattes. Getting asked by another coffee shop patron what race we ran was a little unnerving, considering we had removed our race numbers. For a moment, I was excited about looking like an athlete. Then I noticed that the bright orange timing chip was still attached to my shoe. That's one way to put myself in check.